Most of us could do with more physical exercise than we get in modern life – we are designed for exercise and are diminished by its absence. We will almost certainly live longer and get ill less often if we build some exercise into our lives. Doing an hour of moderate exercise every day will make you more mentally alert, feel better and allow you to tackle problems with more confidence. You must enjoy your exercise to do it regularly – it shouldn’t be a chore. The most rewarding exercise is that which has a secondary or primary purpose – as it always was – working the garden, walking briskly or swimming, riding, jogging or cycling to get somewhere; far better than sitting in a sweaty gym working machines. Riding Kickbikes® is enjoyable – even addictive! Plus you get the added value of being outside, getting where you want, doing mild to moderate aerobic/cardiovascular exercise and using lots of different muscle groups for whole body fitness. Almost anyone of any age or level of fitness can benefit from the exercise gained by riding a Kickbike®. Most competitive athletes use a range of training methods in addition to working on their chosen sports to obtain cardiovascular, muscle speed, strength and endurance fitness. Working out on Kickbikes® is efficient because the rider can improve endurance by maintaining a target heart rate for long periods of time. You will develop muscle speed and strength plus cardiovascular fitness which may improve your running, cycling and tri-times. The low impact and dynamic nature of Kickbike® training will minimize the common impact injuries associated with running. 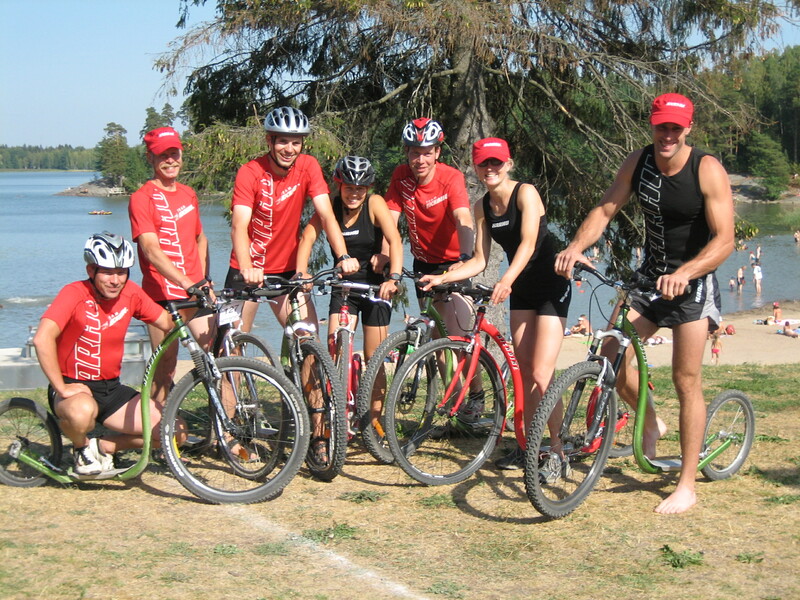 You need just an inexpensive Kickbike® and somewhere to use it to get some of the best cross-training available! – Improve your training! What Joints and Flexures are involved in the Kicking Action? benefit of both types of flexure and rotation. The knee of the standing leg starts and finishes the cycle nearly straight (but not locked) and then reaches its maximum flexure (about 30°) as the kicking foot develops force against the road surface (as the knee has to bend to accommodate the height of the footplate from the road) The ankle flexure more or less mimics this with maximum extension at the same time as the knee is extended. The hip though, is flexing through about 90° reaching maximum flexure at the point the kicking leg is maximally extended rearwards. Throughout the entire cycle, your whole body weight plus any forces generated via the kicking action (by the other leg) are acting on the standing leg. The greatest work is done by the standing leg as it straightens up after the kick. The kicking leg goes through a wide range of flexure of all three joints during the cycle. The knee of the kicking leg is flexed by about 90-100° at the very start and then progressively straightens towards the end of the kick itself to return back to 90° on the recovery stroke. The ankle remains mostly flexed until the contact (with the road) part of the cycle where it progressively straightens. Hip flexure is extremely good starting at about 120° and extending to almost straight at the end of the kick. Maximum work and speed coincide on the kicking leg as and while it makes contact with the road surface and drives the rider forward. It is speed and strength at this point which determines the road speed of the Kickbike® and whether you will out race your opponents! Riding Kickbikes® involves a very wide range of movements and flexure plus intensive work similar to that involved in running, but with very little road impact. Which Muscles are Used and How? 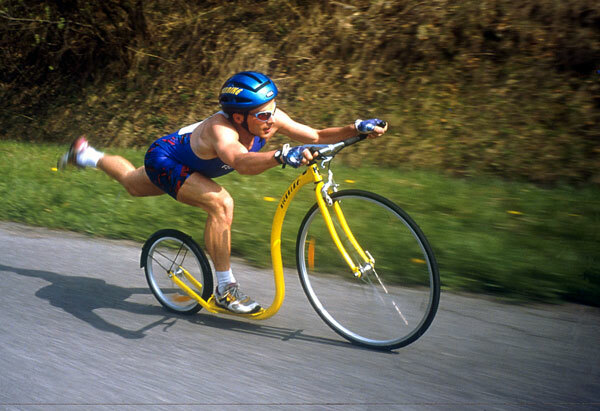 During Kickbike® training, muscle use on the ‘kicking’ leg and ‘standing’ leg are again quite different but roughly emulate cycling and running leg muscle usage respectively. 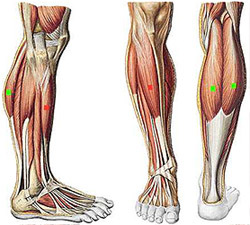 Of course, legs are switched every 3-10 kicks depending on gradient so both legs get the benefit of both types of muscle use. The Standing Leg does a surprising amount of work during the kick cycle of the other leg and is the leg in which fatigue is first felt if legs are not changed frequently enough. At the start of the cycle, the leg is held almost straight with the foot slightly flexed and with the heel off the footplate. All the weight is on this leg as well as vertical and fore-aft forces generated by the kicking action and consequent body movement. 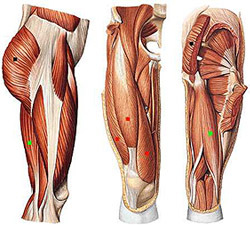 The muscle work (which is effectively isometric) is mostly felt in the quads, but almost all groups of lower leg muscles are used (tibialis and calf – gastrocnemius and soleus) . The standing leg is straight at the end of the kicking cycle. The kicking leg, as noted above, goes through an extended movement cycle where muscles used and forces developed are very similar to running without the impact damage. So hamstrings, calves and glutes are the main muscles used. It should be noted that on the leg uplift prior to starting the cycle, the abdominals come into play as do pecs and biceps/triceps to counteract the forward-backward body movement generated by the kick.